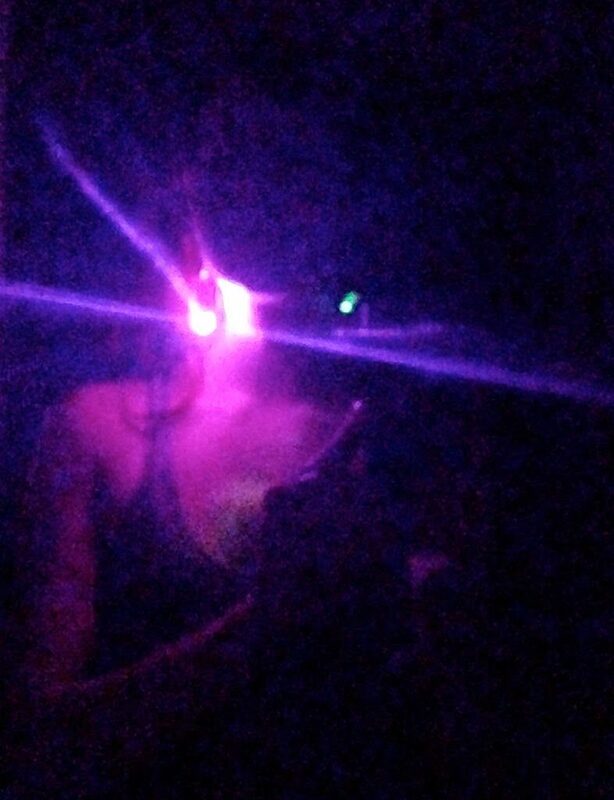 Wearables are an awesome, relatively new extension of circuits. Conductive threads & fabrics make it easy to attach components like LEDs and sensors to clothing/accessories. 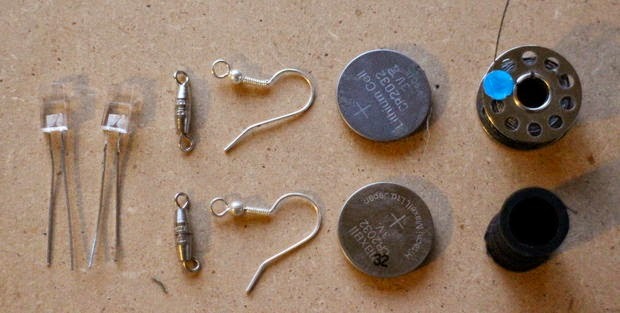 Plus, they are a super fun introduction to electronics! 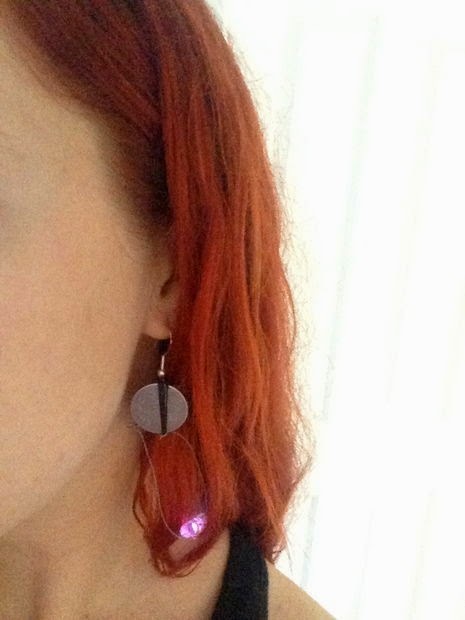 These LED earrings were designed b/c I wanted a wearable that was simple, unique, and could be built by-hand w/ available materials. Purchasing all materials adds up to less than $10, and these can be built in ~ 1 hour (although it does take some patience). Fun fact: LEDs on the higher end of the rainbow (red, orange, & yellow) use less power than colors on the lower end (purple, blue, & green). Mine are non-rechargeable and will probably last for ~20 hours. 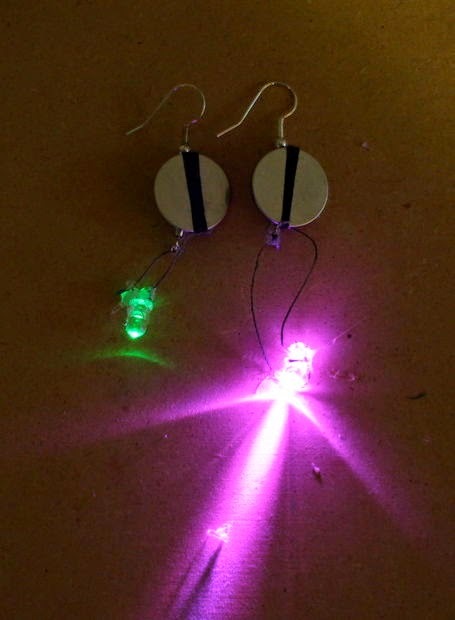 If you want to make them to last longer, use rechargeable batteries (super expensive but worth it if you want to wear the earrings long-term). Used to attach the LED to the battery. 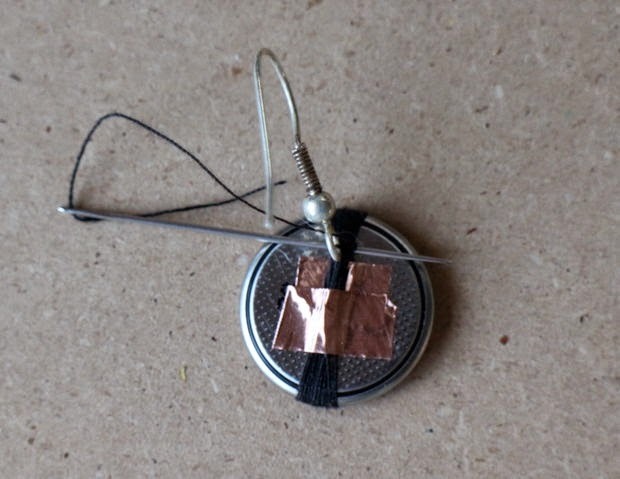 Alternatively, you can use wire or anything else that conducts.. like magnets!Also, since conductive thread loops tend to come undone, I hot glued all the knots to hold them together. These act as a switch so the LED can be turned off when not in use. I had some necklace clasps on hand which worked perfectly, but there are tons of options for switches.. all you need is a way to interrupt the flow of electricity. I used conductive tape, but honestly regular tape works just as well. 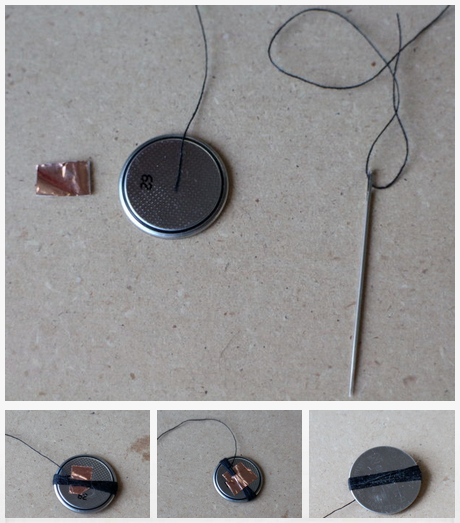 Recommended to get a needle w/ a wide eye b/c the conductive thread has a tendency to fray. Helps w/ cutting the ends of the LEDs. Step 3: Build it! Pt 1: Wrap the battery. Wrap the battery w/ 1.5 – 2 feet of (normal) thread. To make it easier, tape the beginning end of the thread to the back of the battery. Leave at least 6 inches of thread at the end. When finished wrapping, loop the end of the thread under the band and pull tight. Repeat this a few times, then make a knot. Tape the end/thread band down. Step 4: Build it! Pt. 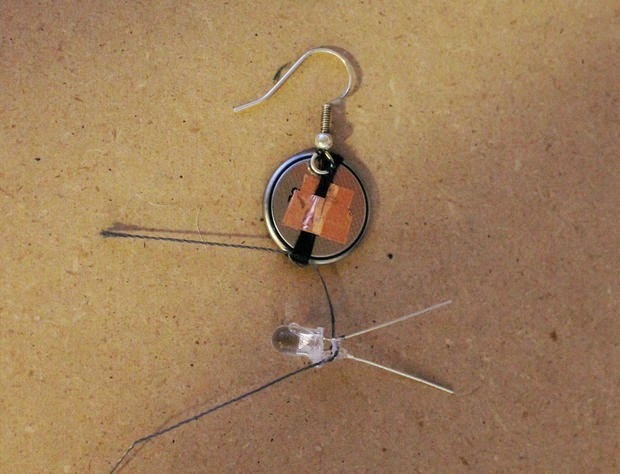 2: Attach earring back. Loop the 6 in. 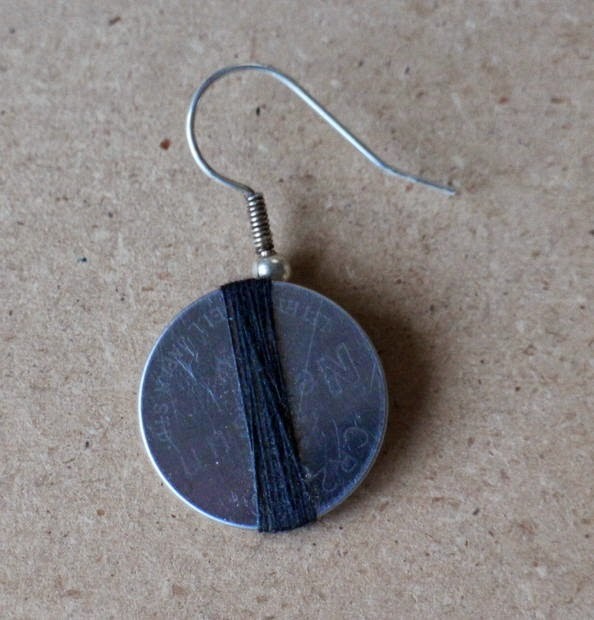 tail of the the thread band through the hole in the earring back. Use the needle to loop the thread under the band & pull tight, kind of like sewing a button. Repeat at least ten times, or until the thread runs out, then tie a knot. Step 5: Build it! Pt. 3: Attach the Positive LED Leg. Tie 6 inches of conductive thread to the positive (longer) leg of the LED. Loop the conductive thread through the bottom of the battery thread band and pull through, leaving the LED ~ 1/2 inche (in.) below the battery. Pull the conductive thread down, so it is only touching the front cover (positive side) of the battery. 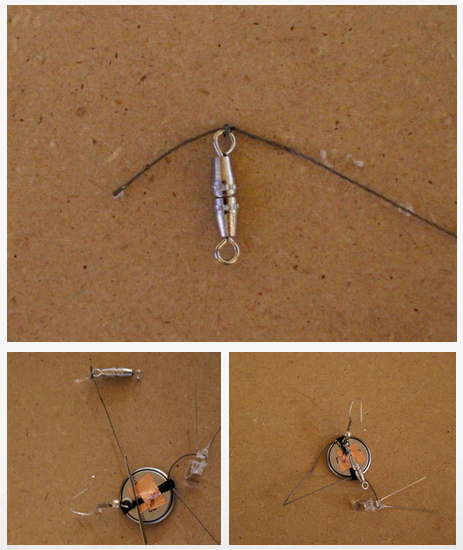 Loop the conductive thread around the battery thread band at least five times, then tie a knot. 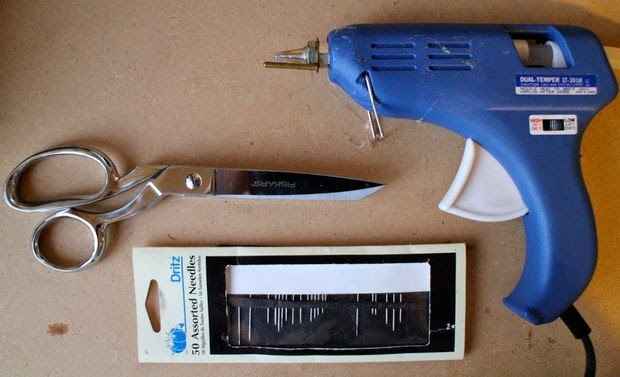 Hot glue the conductive thread knots w/ the littlest amount of glue to help hold it in place. Step 6: Build it! Pt. 4: Attach Clasp. Attach the clasp (aka switch) to the back of the battery w/ ~ 6 in. conductive threadin the same way the earring back was attached: thread the end of the earring back through the thread band on the battery, above the tape, and pull it tight. Repeat at least five times. Tie a knot and hot glue the thread to hold it in place. Step 7: Build it! Pt. 5: Attach Negative LED Leg. Tie the other end of the clasp/switch to 6 in. conductive thread. 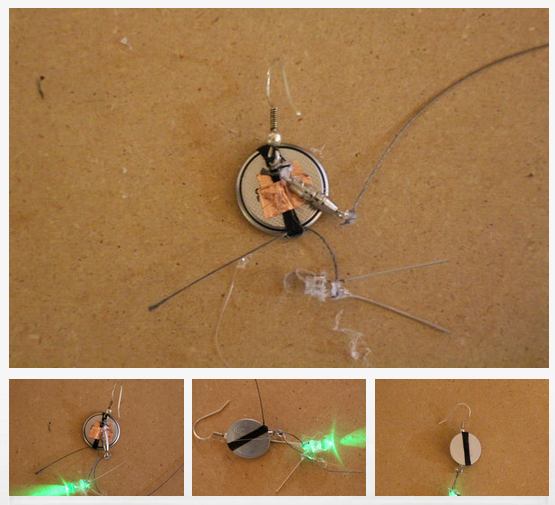 Tie the end of the conductive thread to the negative, shorter leg of the LED, leaving ~ 1/2 in. from the bottom of the battery. Hot glue the knots. Be sure that the LED legs and the respective thread/wires do not touch; otherwise the battery is shorted and the LED won’t turn on. That’s it! Clean up the mess that is hot glue, snip the ends of the conductive thread and, if you’re not going to put them on right away or take photos, unscrew the clasps. Note: The reason the green one isn’t as bright is probably because the battery was quite bit older.